Today I have CAS card to share... I looooove this one!! I used Basic Grey-Knee Highs paper pad and Paper Smooches-Loopy Leaf Die. The sentiment is created with Smash Label maker. Just a few Sequins, pearls, Timeless Twine- Natural twine and color splashes...super simple!! Love to Create : Dies /Punches. 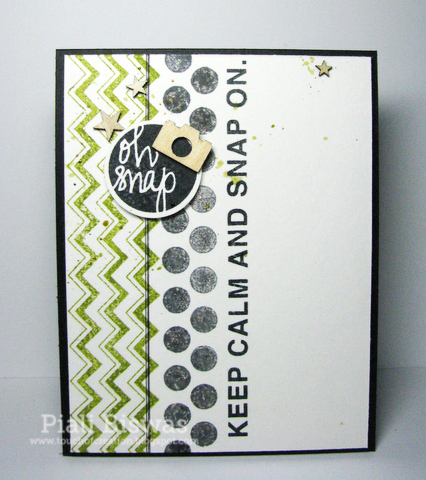 Simon Says Stamp: Anything Goes ! 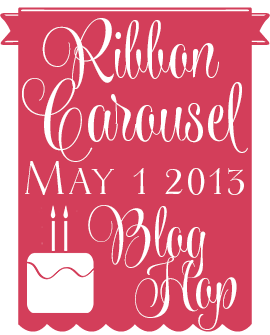 See you all tomorrow for the big blog hop..
Water-coloring is very trendy nowadays!! Its super easy and super fun to do. There is no strict rules to follow or lots of blending to do or special/expensive supplies need for water coloring. Actually you can use any watercolor...like cheap kiddie ones, simple water color pencils, Gelatos, Aquarelle pencils, Inktense pencils, distress markers, distress paints...pretty much anything water soluble and colorful. Okay!! I'm not a PRO but I like trying new trends. 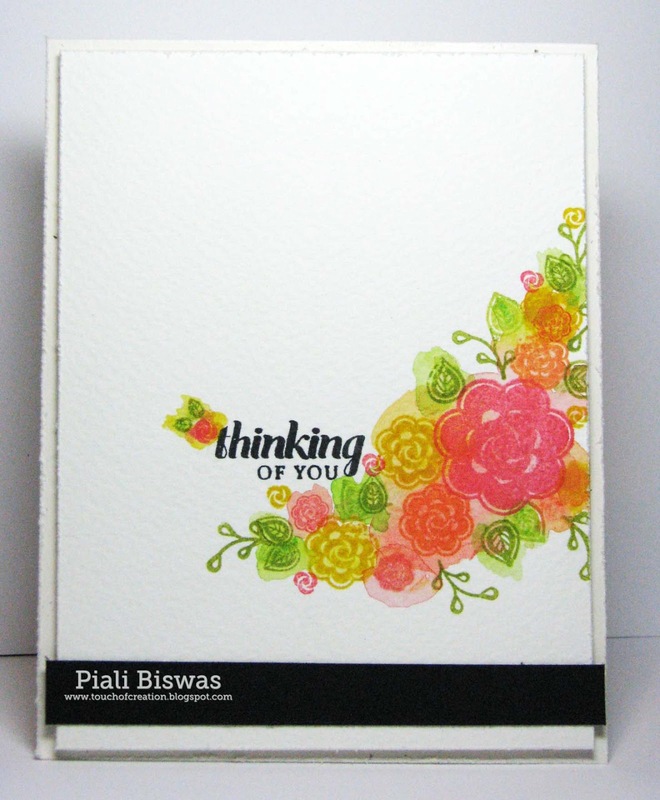 I used THIS Art Impression stamp set for this card....simply colored it with water and Inktense pencils. Pause, Dream, Enjoy: Outdoor critters. Creative Inspirations Paint: Anything Goes. I used Inktense pencils again.. I used the SAME Ai stamp set for this card. 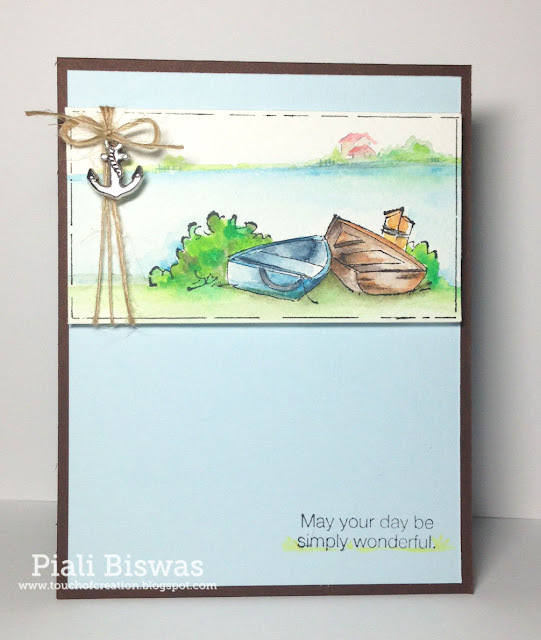 Easy peasy coloring...just added a anchor charm with May Arts Jute twine. ...now for the last card I used Faber-Castell- Aquarelle pencils. This card is done a bit differently...usually I stamp and then color but here I colored the spots where I want to stamp first and them stamped with coordinating inks. The stamp set is from Wplus9. Design Memory Craft: Inspired by gardens. All the 3 watercolored cards are for MOXIE FAB WORLD-Wonder of WATERCOLOR challenge too!!! Did I mention that my Camera broke... Super sad!!! The lens won't move, I love it , its simple one and I've been using it for 4 years now. Now I've to take pics with my iphone..until I get it fixed. iphone is good but not the best for card pics. What do you think the pics are OKAY????? Check out the fun post on Coloring...Coloring Outside the Lines!!! 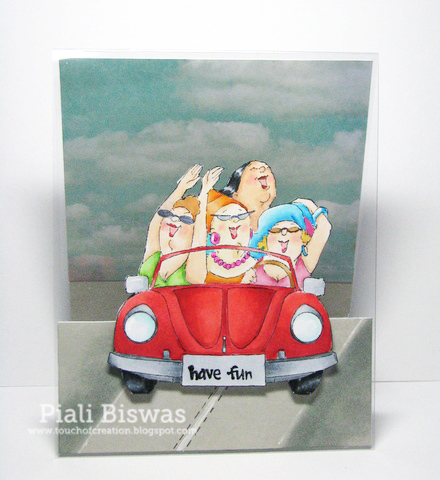 I used Vintage Daydream kit for this card. 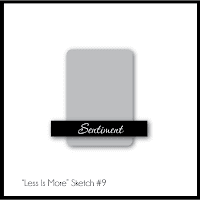 Less is More challenge: Sketch. Creative Corner : Clean and simple. Moxie Fab World: Wonder of Watercolor. 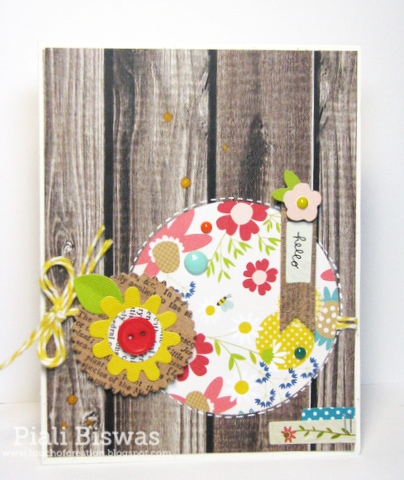 Hop over to TWINE-OLOGY blog to see the fun card I made. Let me know "what do you think about it"...leave a comment THERE. Yep! You got it right you can see the whole car...now how I created it??? 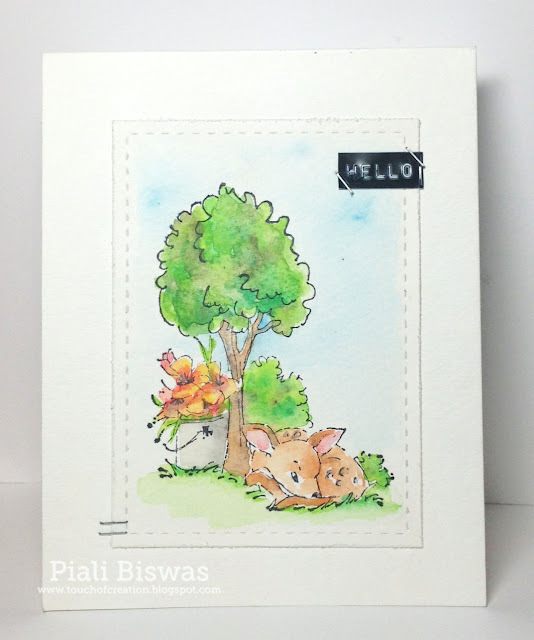 You have to hop over to Art Impression Blog to find it out! City Crafter Challenge : Clouds. 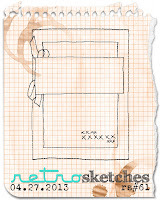 Paper Minutes: Card with Transparency. Loves Rubber Stamps: The great outdoors. 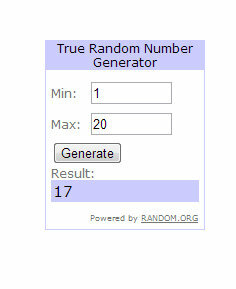 and the lucky winner is.. Please email me your address I'll send the lovely Ai Girlfriends stamp set to you ASAP. Today we're celebrating Michele's B'day in the Ink Squad style!!!! This awesome badge is designed by uber- talented Karen Baker!!! Thank you Karen for organizing this!!!! 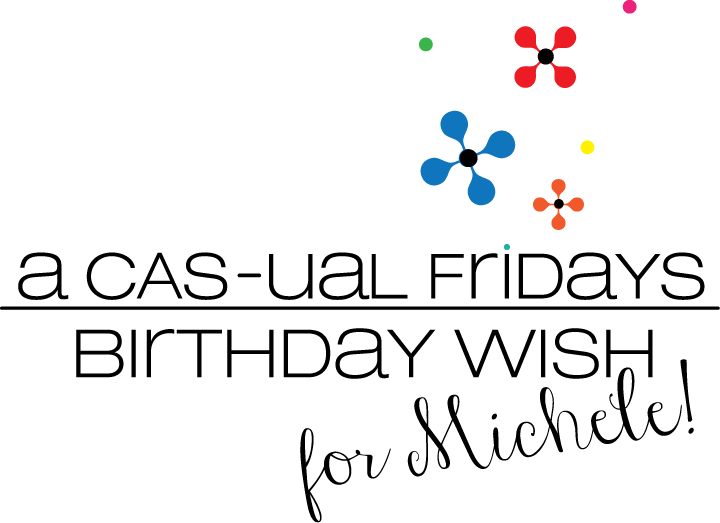 Now you all know Michele.....the owner of CASual Fridays Stamps and Challenge. Michele is an AH-mazing person...super sweet, understanding and awesomely organized( sometimes its scares the procrastinator in Me ). My Letter is D ...so I picked Dandelion & Denim...lovely colors!!! I used perfect pearls after a longtime..inspired by Nicole Heady's video. 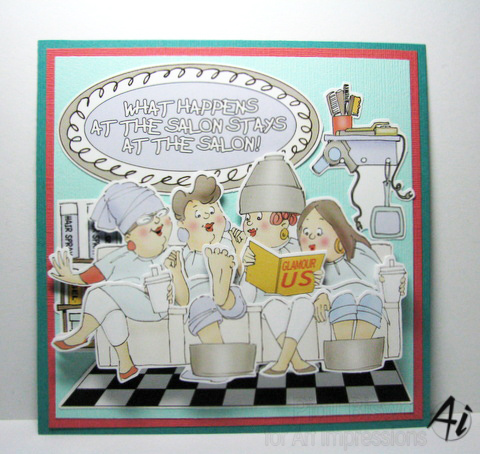 I used several lovely CASual Fridays stamps sets for this card. 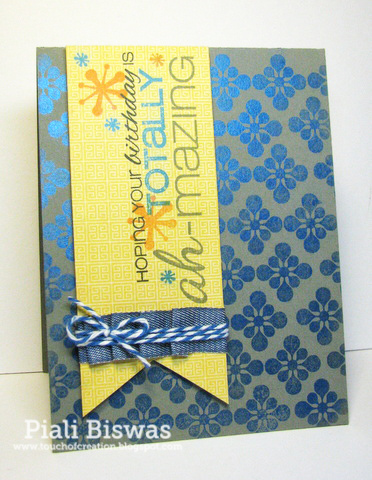 Its hard to show in the picture...but its a very pretty shimmery card up close!!! Stamp Sets : Amazeballs, Bold Wishes,Exclamations and Rad. 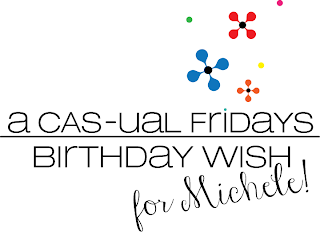 .....hop along and check out the lovely creations, stop by Michele's blog to wish her !! 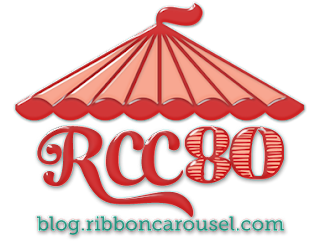 Prize: A Ribbon Carousel for one randomly chosen challenge participants! No stamping at all....just some MME enamel dots and Timeless Twine baker's twine. 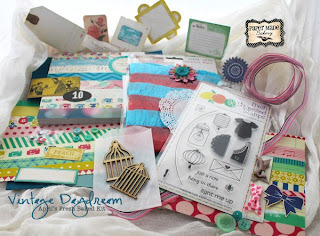 Crafty Bloggers Network: Anything Goes. Scrappy Frogs : Think Spring. Crafts 4 Eternity Recipe Challenge : April showers bring May flowers. Make sure to link up to the original challenge post of the month HERE! Today I'll be sharing a sneak peek of New Ai product. The current Ai challenge is " Layer It Up" so I made a card with lots of layers. Its a pre-colored Decoupage sheet of new release Girlfriends set. The sheet comes with direction and images are label/numbered for easy understanding. In four super easy steps your amazing card will be complete. Check out Ai Blog for step-by-step tut. I used the cardstocks from the Girlfriends Card kit #1. Its AWESOME for any crafters...of any skill level ..or any age. My younger daughter is 7 , she loves Ai images and she wishes to color them like me someday, I'm sure Ai popups will make her very happy...and she will create like a pro. 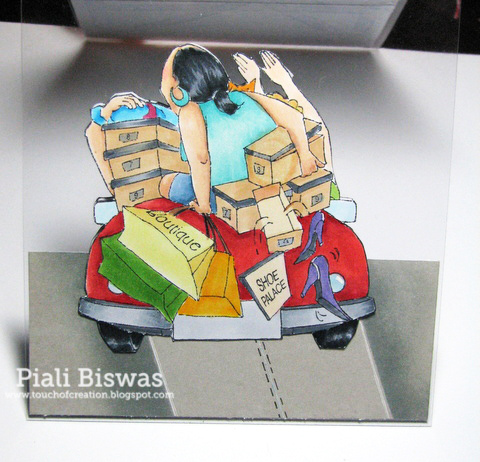 Gives lot of dimension to the card... like 3D effect!!!! Pop Ups will be soon available in Ai store...you can also get them in retail stores now. Crafting for all Seasons: No Stamps allowed. The Stamping Chef : For a girl. Crafty Creations: No Patterned paper. 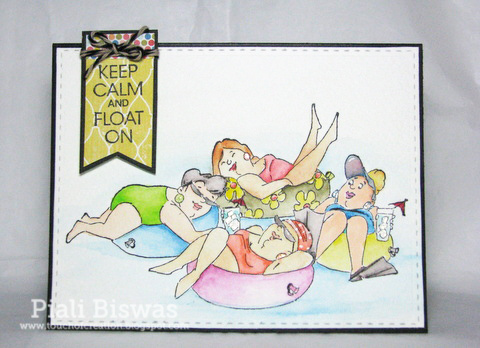 A clean and simple card using the new released Girlfriends set- "Stayin A Float"
I colored the image with Inktense pencils and water brush. Addicted to Stamps and More :Anything Goes. Heck of a Challenge: Just add water. Hope you liked these cards!!! 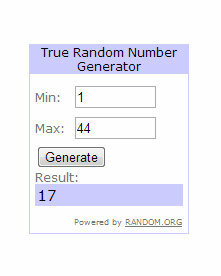 Don't forget to check out our Bloghop winners ..HERE. Make sure to play along with the current Ai "Layer It Up"challenge , you have until May 1 at 5:00 p.m. PST to enter! Please email me your addy and your choice of new girlfriend set, so we can mail it to soon. Have fun creating with it. Thanks Everyone for hopping with us. Stay tuned for my Giveaway winners, I'll post it tonight. For CFS New Release post click HERE or scroll down. Here is a last minute entry for FUSION CARD challenge!! Love the idea of the challenge...super fun!! I missed the last challenge's deadline ...so rushing at the last moment now. Not a great pic ...I know its time for me to get some new lights or light tent for my photos. Sentiment- Hero Arts/Studio Calico . Lots of stamp , isn't it!!!! 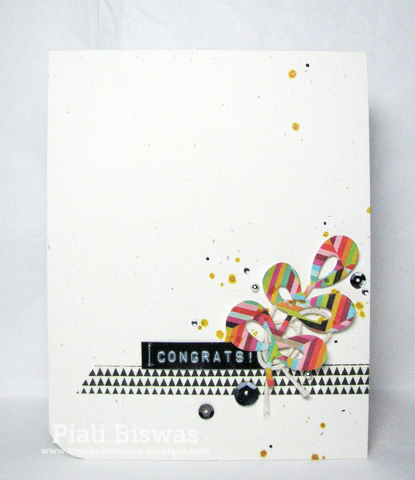 Just embellished the card with some Studio Calico wood veneer.